Metal tiger head school mascot logo artwork on walls. Curved metal ceiling artwork décor piece. Half-wall dividers with glass block décor. 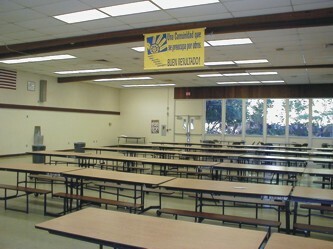 Movable pedestal tables with school mascot logo tabletops. 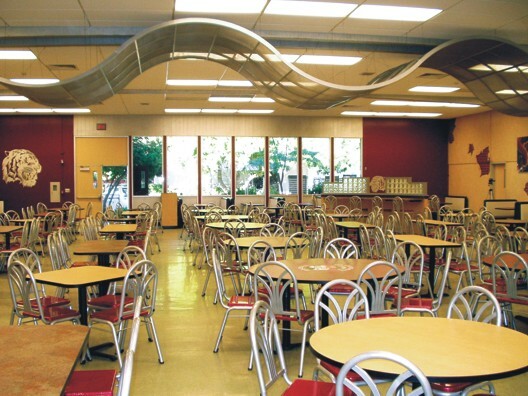 Before: All in all, not a bad cafeteria. Very clean and neat — but not a very inspired or inviting area for the students. After: The Tiger Roars! With “S”-curved ceiling décor and brightly painted walls, the room is attractive. Now it is filled with middle school students - the toughest audience to please.